A few years ago I was struggling. I was dealing with massive student loan debt and cobbling together work on a part-time basis. It was one of the hardest times in my life and I scaled back everything. I have always lived on a pretty minimal budget, but this was the definition of a ‘bare bones’ budget. Travel? Out of the question. I didn’t even see my parents for Christmas. I stopped going to restaurants and every purchase consumed me with anxiety. I scaled back everything I could. And I realized something really powerful. Even though I scaled back on everything, I still didn’t have enough money to pay for my student loans or live a reasonably relaxed life. It was at this time that I realized my problem wasn’t that I was an excessive spender or that I was super frivolous with my money. It was that I wasn’t earning enough. Making $12 per hour at the time, it’s no wonder. Having close to $60,000 in debt at the time and making so little wasn’t really working out for me. Although I was working part-time a few years ago, I knew it wasn’t enough to get where I wanted to go. I began side-hustling seriously to make up for the lack of hours and income. I perused Craigslist and TaskRabbit. I found gigs as an event helper for the holidays. I greeted people at parties. I cleaned up after parties. I took people’s coats. I quickly found out that the holidays are a ripe time to make extra money. I gave it my everything, even though they were pretty simple tasks. I communicated and showed up on time. You won’t believe how doing these two small things will really set you apart from other side hustlers. Because of that, I got offered more gigs. Now, every holiday season I work for the same family and get paid $20 per hour to work their holiday party, helping out with set up. Another one of the gigs has turned into a very part-time job and with it a really great community I’m happy to be a part of. I even looked to make money for doing things that I normally do anyway. For example, I use Swagbucks when searching the Internet and make a few extra dollars a month. It adds up over time and Swagbucks even offers bonuses just for signing up. Side hustling can open up so many doors. If you would have told me that three years ago that taking people’s coats at a party would turn into something else, I would have laughed. But you never know where a gig will take you. If nothing else, it’s a great way to meet new people and make extra income to help pay off debt, save, invest, and more. Need some ideas? Check out over 50+ side hustle ideas to get started today. If you work at a job that offers overtime, always say “yes” to more work. Overtime can help boost your income quickly, doing the same job you’d do anyway — just at a different time. Is your job offering more work on a holidays? Say yes. Working more hours to help out with a project? Say yes. I’m not saying that you should have no personal life, but making yourself available and doing more work can be an easy way to get overtime — which is a great way to make more money. Once I had thoroughly exploited the side hustle scene, I thought it was time to move on to something similar, but a little different. I had already side hustled so much and worked as a house cleaner, brand ambassador, event helper, taste tester, pet sitter and more. I was looking for something I could do a little more long-term that would engage more of my skills and talents. So, I started to freelance. I began writing for others and I quickly realized how addicting it was. I enjoy writing and telling stories and getting people inspired about money. Being persistent. I mentioned that I was looking for work for a good six months before I continually saw results. I also emailed every single person I admired and asked for their advice. You’d be amazed how willing people are to dole out advice and help you along your journey. Utilized my network. There is a saying that your network is your net worth and for me it’s so true. I have a tight knit group of friends and bloggers here in Portland and I’ve pretty much worked for all of them in some aspect. Why? Because I’ve built a genuine relationship with them, have expressed interest in what I want, and shown my value. Don’t be afraid to ask and tell people what you want! Nobody is a mind reader, so it behooves you to be direct. I’ve realized that bold action and clear language have really helped me move forward. So much so, that I quit my job almost a year ago to freelance full-time. I have zero regrets and am now making much more than I did at my old nonprofit job. If you want to start freelancing, I recommend creating a website and blog, and start with your network first. Job boards can be low-paying and competitive. The best thing you can do is to build your reputation and your brand. Many of us are just sitting on years and years worth of stuff that we keep, even though we don’t use it anymore. But the fact is, that if you are not using it anymore, it is simply taking up space. Why not turn your stuff into extra cash? You can sell your old cell phones on sites like SellCell.com. You can bring your old CDs and books to local stores and get cash. You can host a garage sale. Sell on eBay or Craigslist. I actually have one friend who picks up perfectly good “junk” on the side of the road and sells it on eBay. Talk about a nice profit margin! If you haven’t used your items for six months or more, then let go and make some extra cash. Now more than ever, you can make money off your possessions and create a lucrative side business. One of the simplest ways you can give yourself a boost of income is by adjusting your tax withholding. Many people enjoy getting a tax refund once a year, but let’s face it: it’s hard to do the right thing when you get a lump sum of money. By adjusting your withholding, you’ll see more money on your paycheck now so that you can pay off debt and save. You can even grow that money through investments or a savings account. Why wait to get a “bonus” once a year? If you have any questions, discuss with a tax professional. I’ve already mentioned that I never use to negotiate in my jobs. I was simply too happy to have a job and didn’t want to rock the boat. Now I realize I missed out on thousands of dollars in extra income by not negotiating. Now that I’ve been a full-time freelancer for almost a year, I’ve learned the hard way how to negotiate. After working too many low-paying gigs, I’ve now learned how to comfortably ask for more. It’s all about knowing your value and being confident. Confidence is half the battle. I’d even say that confidence is just as important as talent. If you are in a job, make sure you are negotiating regularly. If you are a freelancer, or a side hustler, raise your rates from time to time. After you prove your value and build a client base, there is no reason to continue working for low amounts. It’s easy to get comfortable, but you should always be challenging yourself and working hard to make more. 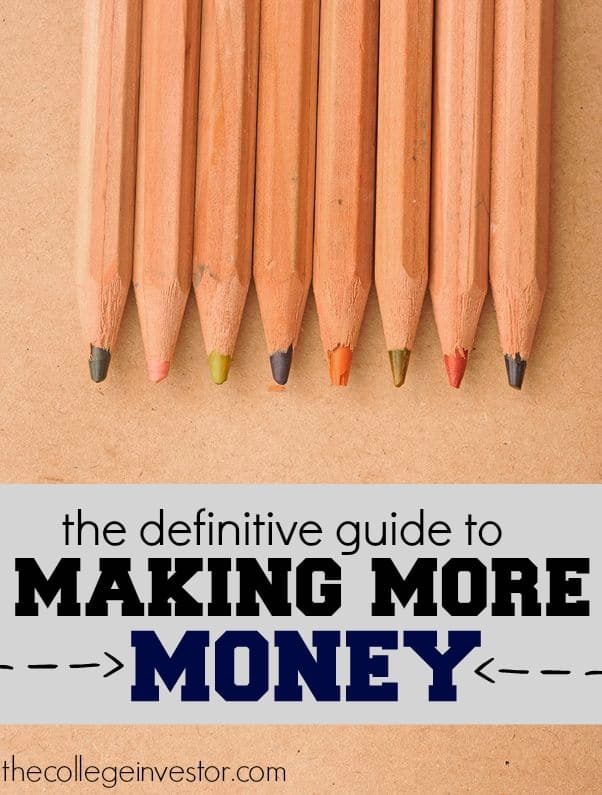 Whether you are struggling to pay your bills or just looking for ways to make even more money, you can use these tips to get started and make more money. Making more money can expedite your debt repayment process or completely overhaul your savings strategy. Though I love being frugal and saving money where I can, there is still a finite amount I can save. Conversely, my income is essentially limitless — it all just depends on how much work I can do in a day and valuing my services. By using these very strategies above, I went from struggling and making $12 per hour three years ago to now making close to $50,000. Anyone can make more money if they really want to. 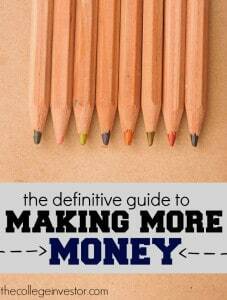 What are your thoughts on making more money? Great tips! Uber just joined my city… I’ve got a 3 month old baby, so Ill give driving a shot! Nice! Let us know how it works out.